There’s no such thing as an early bedtime for Charles “Chip” Greeno. That’s because for the past 23 years, he’s worked the door at establishments in Rutland, Killington and as far away as New York, staying from when the doors open to past last call, checking IDs and making sure people get home safely at the end of the night. Now, after a series of disputes with city officials and the Rutland City Police, it’s a line of work he’s giving up. Greeno grew up in Rutland and attended Rutland High School. At 17, he started working as a doorman around the region. In that time, he said he’s proud of his record of enforcing the rules. “In 23 years the business that I worked for never received a fine,” he said. Greeno, now 45, became the owner of The Local on Merchant’s Row in 2011 and has since done extensive renovations of the bar, repainting the ceiling and walls and remodeling a DJ booth. Last summer he installed a concrete bar on the back patio. After opening, he teamed up with local DJ Craig Hahn to host the weekly parties for international workers at local ski resorts. During these events, Greeno said he goes “above and beyond” for security. Patrons are wanded with a metal detector. One of the five to six doormen wears a GoPro camera as patrons enter and seven video cameras monitor the bar during the night. During an interview with the Mountain Times, Greeno produced a cardboard box filled with over 1,000 confiscated IDs. Some are cheap imitations made with laminated paper while others are sophisticated forgeries from 48 states. The cards are bound together in stacks two inches thick with rubber bands. At the end of the night, Greeno operates a free shuttle to bring riders as far away as Killington, Castleton, Pittsford and Wallingford. Despite all this, Greeno said the Rutland City Police have maintained a consistent presence outside The Local, which he said has discouraged patrons from entering. 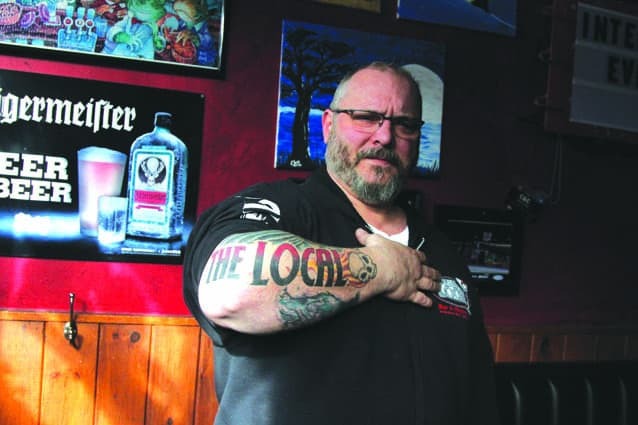 According to enforcement history from the Vermont Department of Liquor Control, The Local was cited in September 2012, November 2013, June 2015, April and November 2016 for violations including over-serving patrons, fights, improperly trained employees, employees consuming alcohol after serving hours, providing false information to the Department and not complying with orders to wand patrons. The Local was ordered to serve suspensions for a total of ten days in 2014, eight days in 2015 and 21 days in October. On Dec. 30, The Local was cited for a fight and an intoxicated person on the premise. Recently, Greeno offered to serve a two month suspension to the state liquor control board, during which time he would run the international party as an alcohol-free event. His offer was declined. “That told me that the state is in more of a mind to fight than I had previously thought,” he said. Greeno said he is discussing litigation with his attorney Matthew Hart. As of press time for the Mountain Times, no action had been filed. In five years, The Local has donated $35,000 from cover charges to local organizations including the Boys and Girls Club, BROC, Rutland County Women’s Network & Shelter, American Cancer Society and more. “That’s what I’m the most proud of,” he said. Greeno’s last day as the owner is Feb. 8. He said it’ll be up to the bar’s next owner if the parties will continue. Last summer, he opened a fireworks store in Pittsfield and plans to spend more time working there. Chip Greeno’s forearm bears the name of the bar he’s owned for the past five years.